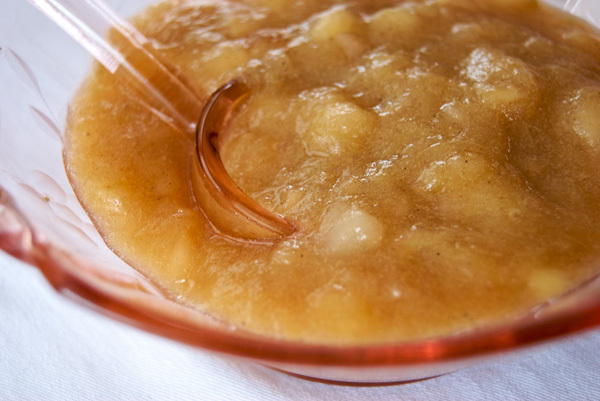 Rhubarb Applesauce. Photo Credit Kristin Camplese. I added fresh ginger because it marries with the rhubarb so nicely. Then I sweetened this with a bit of honey, and it worked well. I think it would also be wonderful with some freshly chopped chives or rosemary. Don’t forget to share your favorite rhubarb recipe this week for a chance to win a pound of rhubarb from Jade Family Farm. See details about the contest. Combine all ingredients (except herbs) in a medium saucepan and bring to a boil over medium heat. Simmer for 20-30 minutes until completely softened and the rhubarb is falling apart. If your apples are still too chunky, you can use a potato masher to break them up. Serve as a side dish or with grilled meat. Serves 4.